Big data and real-time analytics service Mixpanel is unveiling a new tool that will help app developers solicit feedback from their users in a qualitative manner. Aptly called Mixpanel Surveys, it’s almost akin to what one would find within SurveyMonkey except that it’s a native mobile experience and comes as part of Mixpanel’s People Analytics service. The company’s newest product is available through Mixpanel’s SDK and will work only for iPhone apps. An updated Android version is expected soon. We spoke with Mixpanel’s founder and CEO Suhail Doshi and he explained that right now, developers are still trying to find the best way to get feedback from their users. In the current scenario, whenever a company asks for opinions, it sends an email to its users that links to a survey page hosted on a third-party platform, such as SurveyMonkey. However, when you’re on a mobile device, having to jump from the email to take the survey is a cumbersome process — Doshi thinks that there’s a way to streamline the whole thing. Mixpanel Surveys takes this process and merges it into the mobile application so it’s all done without having to exit multiple programs or jump back and forth. Doshi touts that the surveys will appear to be all part of the app experience and will appear only once. 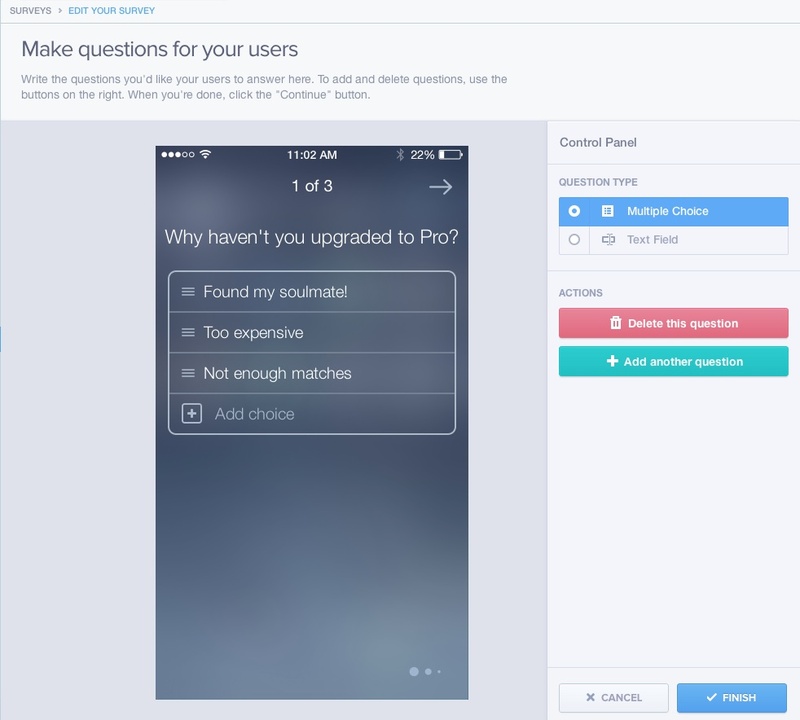 Developers can easily craft their surveys using Mixpanel’s mobile WYSIWYG (“what you see is what you get”) editor, which the company claims could be the first of its kind. A variety of question types can be entered, including open-form, multiple choice, rank voting, and more. There’s no limit to how many questions one could insert into a survey, although Doshi suggests that since it’s on mobile, users may only tolerate a few questions being asked before growing tired of it. 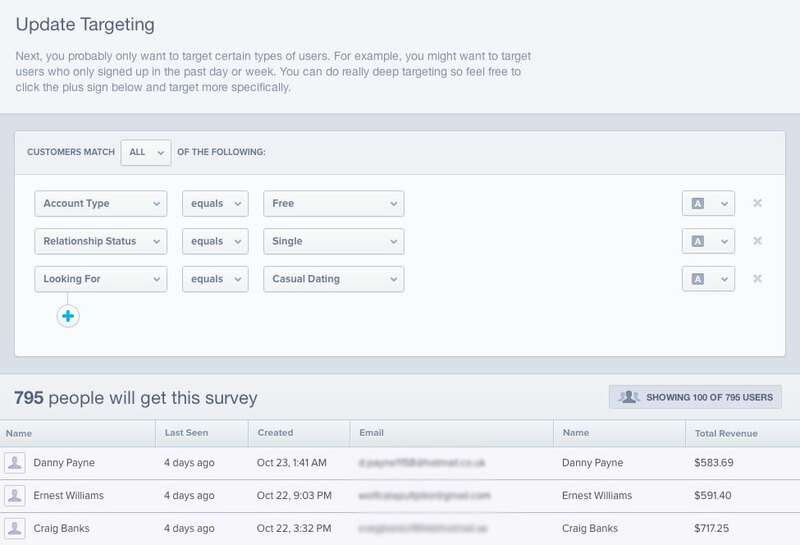 Once a survey has been generated, developers can also pick who they want to target. This can be done in one of many ways: either by specific users from its database and powered through People Analytics, or by going after those based on age, city, platform, gender, or if they’ve done something specific on the app. 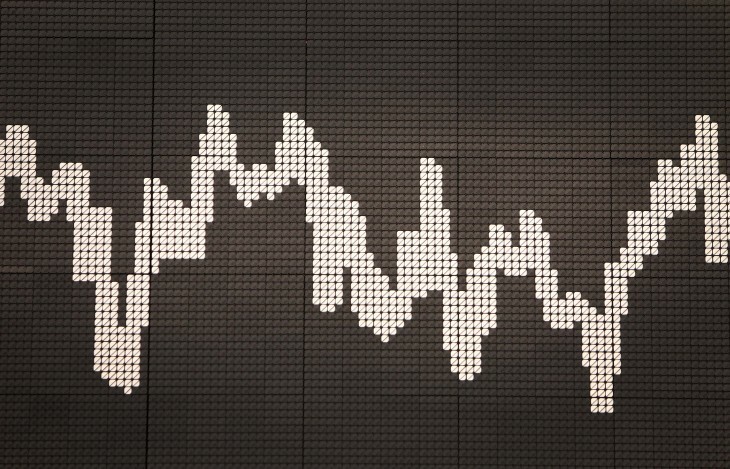 All of the data is collected on Mixpanel’s servers and analyzed in a quantified manner. However, developers can download it later on for further analysis if they so choose. Doshi tells us that app users will see the survey appear when the app first loads and they have the option of either completing it or exiting. Once exited, that particular survey should no longer appear, regardless of whether or not it was completed. However, it does not prevent other surveys from appearing in the future. One important note that developers and app users should be aware of is the fact that identifiable data could be transferred over when a survey is completed. Typically, when a survey is completed, the creator doesn’t know who responded unless an email address or name was voluntarily provided. However, with Mixpanel Surveys, developers could know exactly who responded based off of your account information — if I get a survey while signed into Path, for example, once I respond, it could send along my account name and email address. Doshi says that this could happen and states it’s up to the developer to determine how much information that they want to collect. He thinks that it will be useful for developers to have so that they can follow up, although he believes this will be a small percentage. Nevertheless, being able to complete a survey anonymously is out of the question. Unfortunately, there’s no way for users to opt-out or prevent this information from getting sent. Although Surveys is included in Mixpanel’s SDK, developers will only be able to create them if they also are using the company’s People Analytics offering.